To achieve energy efficiency is very important for future cognitive radio networks since we need less power consumption and much more transmitted information. 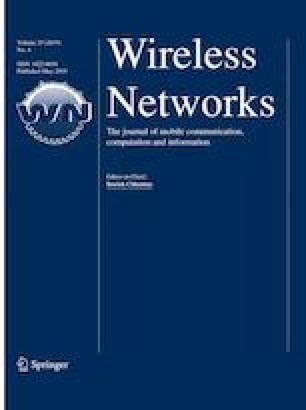 In this paper, we propose a power allocation scheme with robust energy efficiency consideration for appropriately guaranteeing target signal to interference plus noise ratio (SINR) requirement for cognitive users and the received interferences at primary receivers below a threshold. A time-varying interference threshold protection factor and a protection margin to the SINR targets are introduced for the above purpose. This problem is formulated as a fraction programming problem solved by an iterative algorithm based on Lagrange dual approach by convex transformation. Simulation results show the validity of the proposed algorithm on both energy efficiency and robustness under channel gain disturbance. This work was supported by the Nation Natural Science Foundation of China (No. 61501059) and Jilin province Education Office (No. 2016343). We would like to thank the anonymous reviewers and the editor, whose invaluable comments helped improve the presentation of this paper substantially.